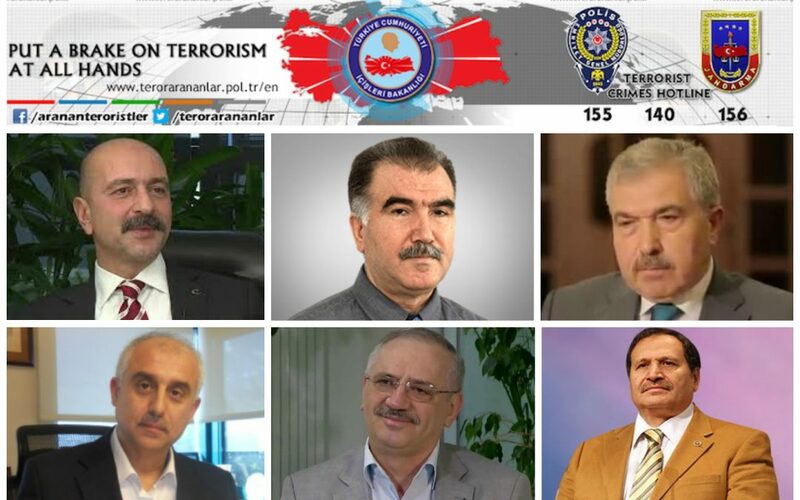 In a move that is likely to make them the target of hate crimes, the Turkish government has included the names of 37 people allegedly linked to the faith-based Gülen movement on a list of most dangerous terrorists, offering as much as TL 4 million in rewards to those providing information leading to the arrest of these people. The list carries the names and details of hundreds of people from various terror organizations, ranking them in five color-coded categories from red (the most wanted) to blue, green, orange and grey. Last year, the ministry had added the name of Turkish-Islamic scholar Fethullah Gülen to the red category, in which there are also the names of senior Kurdistan Workers’ Party (PKK) operatives. In its latest move, the ministry added the name of Adil Öksüz, who is considered to be the prime coup suspect, in the red category. Any person providing information to Turkish authorities leading to the arrest of people in the red category will be granted a reward of up to TL 4 million. Öksüz is accused of being the head of the movement’s alleged network within the air force and was briefly detained after the coup attempt. There is widespread controversy and suspicion regarding his involvement in the coup attempt and his ties to the Gülen movement. In addition to Öksüz, the names of İsmail Büyükçelebi, Mehmet Ali Şengül, Naci Tosun, Abdullah Aymaz, Ahmet Kara, Mehmet Erdoğan Tüzün and Mustafa Özcan, who are renowned figures of the movement, have been added to the red category. In the blue category are the names of Necdet Başaran, Necdet İçel and Nevzat Ayvacı, while Harun Tokak, İsmet Aksoy and Mustafa Yeşil are in the green category. Yeşil was the president of the now-closed Journalists and Writers’ Foundation (GYV). The organization was shuttered by the government along with hundreds of other similar Gülen-linked organizations and educational institutions in the aftermath of the coup attempt. The name of Cevdet Türkyolu, a figure close to Gülen, has been added to the orange category. The gray category includes the names of Halit Esendir, who was the head of a journalism organization in Turkey; Hamdullah Bayram Öztürk, a columnist at the Gülen-linked Zaman daily; Hamdi Akın İpek, a businessman whose companies were seized by the government due to his links to Gülen; Şerif Ali Tekalan, former rector of the now-closed Fatih University; and Zekeriya Öz, a public prosecutor who took part in corruption investigations that became public in late 2013 in which senior government members were implicated. The July 15 coup attempt killed over 240 people and wounded more than a thousand others. Immediately after the putsch, the government along with President Recep Tayyip Erdoğan pinned the blame on the Gülen movement despite strong denial from the movement of its involvement. The ministry’s move came at a time when Gülen followers are receiving threats and subjected to attacks across Turkey and also in Europe by supporters of Erdoğan. Turkey’s infamous mob boss Alaattin Çakıcı recently implied in a letter to the Justice Ministry that his mafia network could kill Gülen, who lives in self-imposed exile in Pennsylvania, and his senior followers elsewhere in the world. Çakıcı’s letter came weeks after Turkey’s controversial request that the US extradite Gülen. “Dear Justice Minister, you and the president continually demand the extradition of FETÖ. Why do you bother with that? There are so many patriots in this glorious nation who are not capable of bringing FETÖ back to the country but are able to bury him in Pennsylvania. They would also die there with pleasure for the sake of this sacred cause. Regardless of their numbers and the countries in which they live, high-ranking FETÖ members could be killed with just a request,” Çakıcı’s letter, published by the Birgün daily in mid October, said. FETÖ — short for Fethullahist Terror Organization — is an abbreviation coined by the government to label the Gülen movement as terrorist despite the lack of a court decision to that effect. “Please, do not ask the US to extradite this ignoble FETÖ anymore. The patriots of this nation know well how to do away with him and his senior managers,” Çakıcı said, reiterating his earlier remarks at the end of the letter. Although the Gülen movement strongly denies having any role in the putsch, the government accuses it of having masterminded the foiled coup. Gülen, who inspired the movement, called for an international investigation into the coup attempt, but President Erdoğan — calling the coup attempt “a gift from God” — and the government initiated a widespread purge aimed at cleansing sympathizers of the movement from within state institutions, dehumanizing its popular figures and putting them in custody. More than 100,000 people have been purged from state bodies and 35,000 arrested since the coup attempt. Arrestees include journalists, judges, prosecutors, police and military officers, academics, governors and even a comedian.